An Indian army soldier takes a video with his mobile phone as smoke rises from a house during a gun battle in Chadoora town, about 25 kilometers (15 miles) south of Srinagar, Indian controlled Kashmir, Tuesday, March 28, 2017. 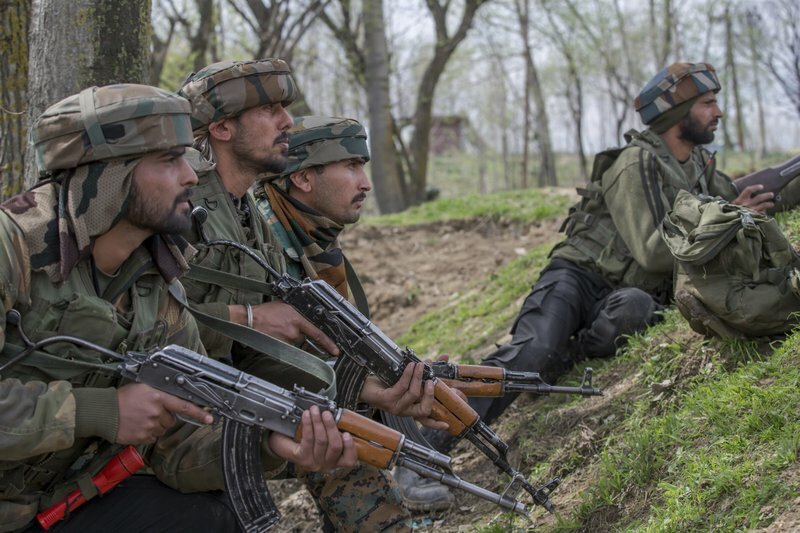 The gunbattle began after police and soldiers cordoned off the southern town of Chadoora following a tip that at least one militant was hiding in a house, said Inspector-General Syed Javaid Mujtaba Gillani. A Kashmiri protester throws a glass bottle at Indian security forces during a protest near the site of a gun battle in Chadoora town, about 25 kilometers (15 miles) south of Srinagar, Indian controlled Kashmir, Tuesday, March 28, 2017. 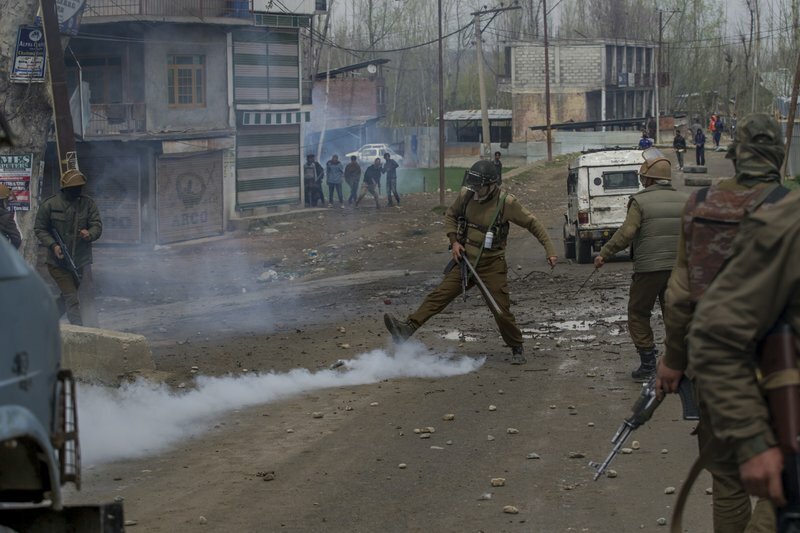 Three civilians were killed and 28 other people were injured in anti-India protests that erupted Tuesday following a gunbattle between rebels and government forces that killed a rebel in disputed Kashmir, police and witnesses said. The gunbattle began after police and soldiers cordoned off the southern town of Chadoora following a tip that at least one militant was hiding in a house, said Inspector-General Syed Javaid Mujtaba Gillani. As the fighting raged, hundreds of residents chanting anti-India slogans marched near the area in an attempt to help the trapped rebel escape. 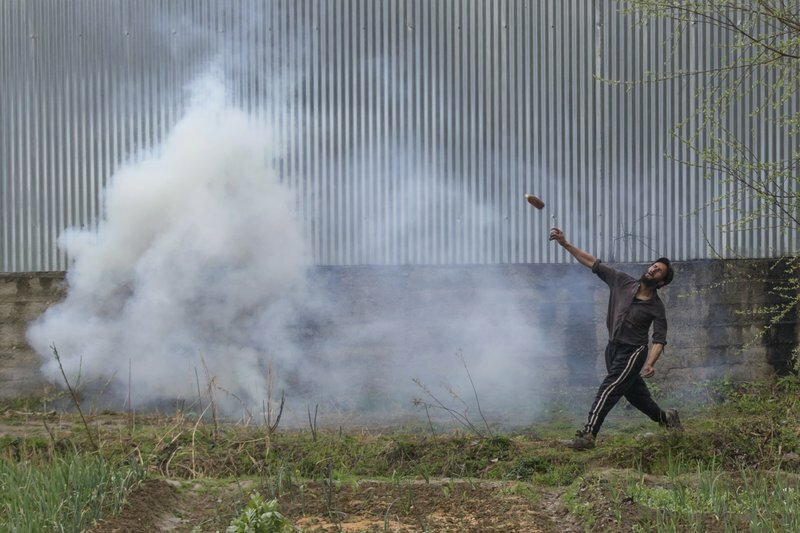 An Indian policeman kicks an exploded tear gas shell during a protest near the site of a gun battle in Chadoora town, about 25 kilometers (15 miles) south of Srinagar, Indian controlled Kashmir, Tuesday, March 28, 2017. 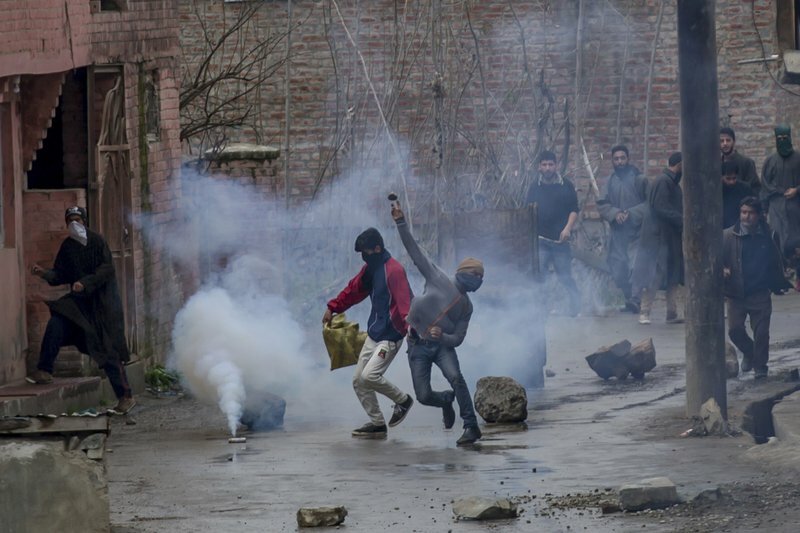 Three civilians were killed and 28 other people were injured in anti-India protests that erupted Tuesday following a gunbattle between rebels and government forces that killed a rebel in disputed Kashmir, police and witnesses said. The gunbattle began after police and soldiers cordoned off the southern town of Chadoora following a tip that at least one militant was hiding in a house, said Inspector-General Syed Javaid Mujtaba Gillani. As the fighting raged, hundreds of residents chanting anti-India slogans marched near the area in an attempt to help the trapped rebel escape. 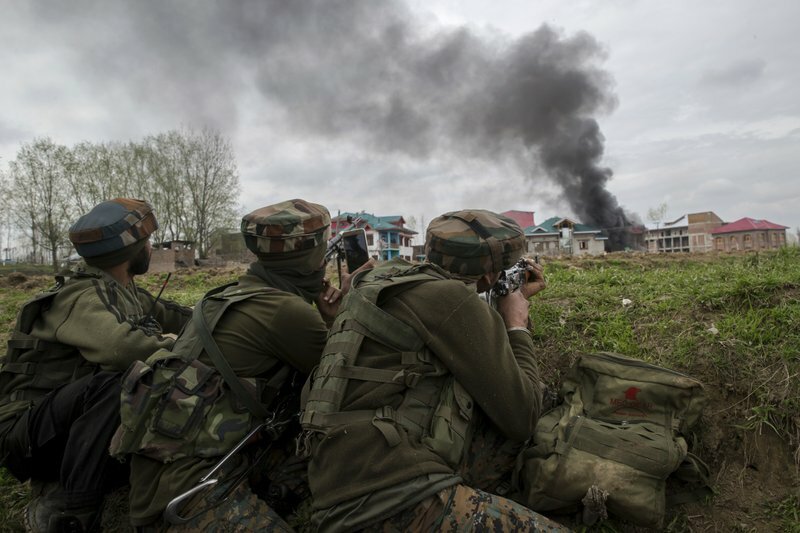 Indian army soldiers take position near the site of gun battle in Chadoora town, about 25 kilometers (15 miles) south of Srinagar, Indian controlled Kashmir, Tuesday, March 28, 2017. 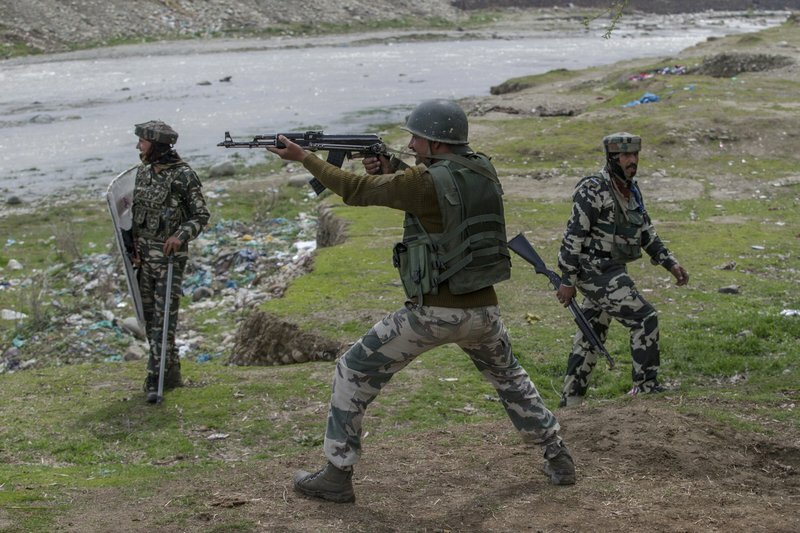 The gunbattle began after police and soldiers cordoned off the southern town of Chadoora following a tip that at least one militant was hiding in a house, said Inspector-General Syed Javaid Mujtaba Gillani. As the fighting raged, hundreds of residents chanting anti-India slogans marched near the area in an attempt to help the trapped rebel escape. 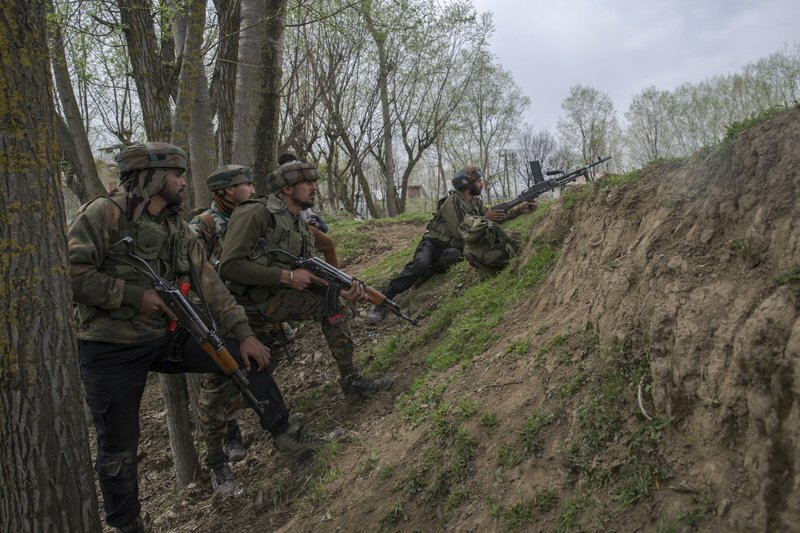 Indian army soldiers take position near the site of a gun battle in Chadoora town, about 25 kilometers (15 miles) south of Srinagar, Indian controlled Kashmir, Tuesday, March 28, 2017. 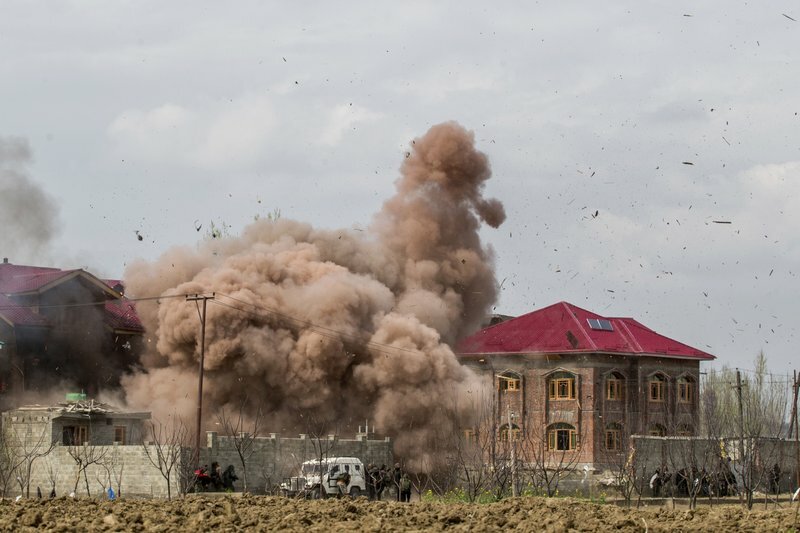 The gunbattle began after police and soldiers cordoned off the southern town of Chadoora following a tip that at least one militant was hiding in a house, said Inspector-General Syed Javaid Mujtaba Gillani. As the fighting raged, hundreds of residents chanting anti-India slogans marched near the area in an attempt to help the trapped rebel escape. 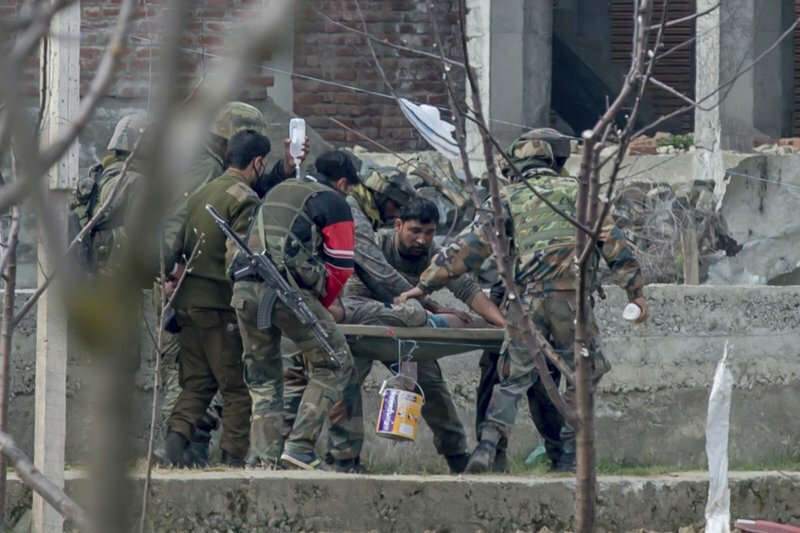 Indian army soldiers carry a wounded colleague on a stretcher towards an ambulance during a gun battle in Chadoora town, about 25 kilometers (15 miles) south of Srinagar, Indian controlled Kashmir, Tuesday, March 28, 2017. The gunbattle began after police and soldiers cordoned off the southern town of Chadoora following a tip that at least one militant was hiding in a house, said Inspector-General Syed Javaid Mujtaba Gillani. As the fighting raged, hundreds of residents chanting anti-India slogans marched near the area in an attempt to help the trapped rebel escape.